With its simplicity, ease of use, economic and ecological characteristics, plasma technology is an attractive prospect. Its diverse areas of application benefit numerous sectors: aeronautics, automobile industry, packaging, optics, microelectronics, etc. 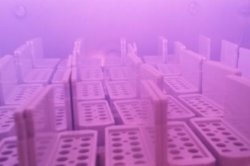 Plasma technology involves placing the materials to be treated into a vacuum chamber, into which a process gas such as argon or oxygen is injected at low pressure (between 0.01 and 1 mbar). Supplying energy in the form of an electric field with a frequency varying between continuous and microwave frequencies causes the gas to decompose partially, resulting in the state of plasma. The species resulting from this decomposition are composed of ions, electrons and various radicals. These radicals are extremely reactive. They may react with each other and with the surrounding surfaces, including the surface of the material that is being treated. Surface reactions then occur that lead to a functional modification of the surface. Among the species generated by plasma, they are metastables which have long lifetimes and therefore have a very wide range of action. They can react outside plasma zone (post-disharge treatment). Parts with complex forms and large parts can thus be treated. The exposure time can vary from a few seconds to a few minutes depending on the process. The principle is the same as vacuum plasma, except that electric fields used is much more intense. It is for this reason that the plasma torches are small. This technology is particularly well suited to small, relatively simple form surfaces and for 2D surfaces (film).